Much has changed since I reviewed three beers from Harvester Brewing last April. The company has a new name, new brews, and has tweaked recipes of old favorites. Ground Breaker Brewing, based in Portland, Oregon, uses ingredients like Willamette Valley chestnuts and Indie hops to brew a variety of beers. Ground Breaker currently has four beers available year round and three seasonal beers, all available in 22-ounce bottles. Dark Ale (4.5% ABV): A gold medal winner at the 2014 Great American Beer Festival, the Dark Ale features a reformulated recipe using roasted lentils instead of gluten-free oats. While I can't do a side-by-side tasting of the oat-based recipe to the new one, I can say that this beer certainly maintained its body and roasted flavor. The flavors of cocoa nibs and coffee are great in this cold weather. If you are fan of Glutenberg's Red Ale, be sure to give this year-round beer a try. Pale Ale (5.8% ABV): Light and crisp, Ground Breaker's Pale Ale is dry hopped with Cascade and Meridian hops. I was able to taste the sorghum in this brew more than any of the others. It's similar to the Cascade Fresh Hop Ale (see below), but perhaps due to the addition of fresh, wet hops I didn't notice the sorghum flavors in the Fresh Hop at all. IPA No. 4 (6.8% ABV): The brewers turned the dial up to 11 for this one. Weighing in at 90 IBU, this is a big hop bomb. Nice head and lacing welcome the drinker of this beer along with a wet and sticky hop aroma. The hop flavor is matched with a nice malty backbone from the roasted buckwheat and lentils. This was my favorite among this group of beers. An excellent IPA that I challenge non-gluten-free beer drinkers to try. IPA No. 5 (5.6% ABV): Ground Breaker chose Crystal and Santiam hops for this very drinkable India Pale Ale. This beer has a great aroma and piney hop flavor - something drinkers expect from a West Coast IPA. Cascade Fresh Hop Pale Ale (5.8% ABV): Only a small batch (15 barrels) of this Experimental Ale Series offering was made last Fall. Brewed with fresh Cascade hops, Fresh Hop was meant to be enjoyed as soon as possible. This was the first beer I tried from this batch and it did not disappoint. Fresh Hop has excellent hop flavor with a touch of Belgian-style candi syrup peeking through. Squash Ale (5.7% ABV): Squash Ale is an excellent darker brew with a unique squash flavor. Ground Breaker adds cinnamon, nutmeg and coriander to spice up this beer. In stark contrast to the syrupy pumpkin beers that I had in my pre-gluten-free days, this Fall seasonal is very drinkable. One thing that Ground Breaker hasn't changed is their brewing approach. They continue to push the limits of gluten-free brewing with exceptional and innovative beers. 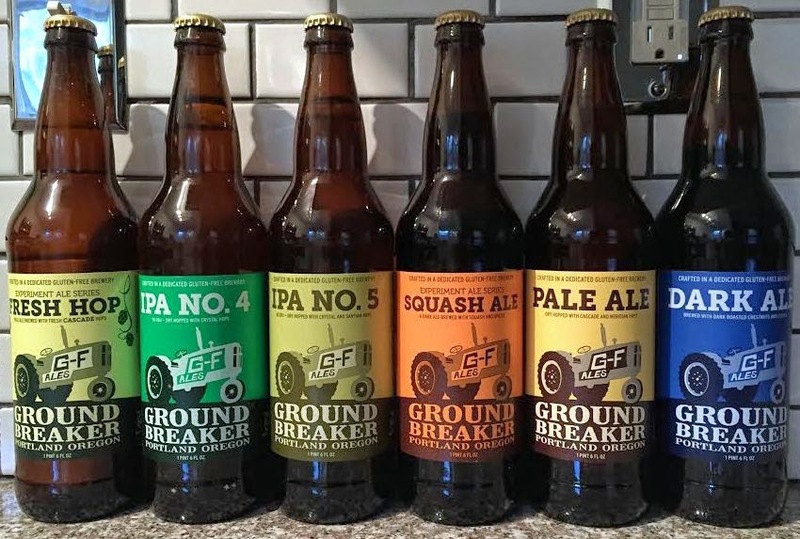 Since my last review, Ground Breaker has expanded its reach and its beers can now be shipped to New Jersey and Delaware addresses. (Exceptions are Alabama, Arkansas, Kansas, Kentucky, Maryland, Massachusetts, Minnesota, Mississippi, New Hampshire, North Dakota, Pennsylvania, Texas and Utah.) The four year-round beers and the Winter seasonal, St. Denny Dubbel style ale, are currently available and can be ordered online. They just do it better on the west coast, huh? That Squash Ale sounds interesting-- I've never heard of anything like it.